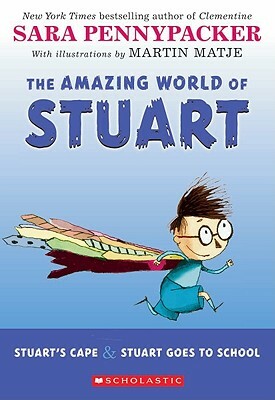 STUART'S CAPE - Stuart and his flaky family have just moved to town, and there’s plenty to worry about. Stuart is very good at worrying, but not so good at waiting. Impatient for an adventure, he makes himself a cape from a hundred old ties and from then on, he has one preposterous adventure after another. STUART GOES TO SCHOOL - A new town, a new school, no friends yet. Stuart has plenty to worry about. Luckily, he has a magical cape. Can he control the adventures his cape creates in order to impress his classmates, or will he become the laughing stock of the whole third grade? Sara Pennypacker is a bestselling author whose title include the Clementine series: CLEMENTINE, THE TALENTED CLEMENTINE, and CLEMENTINE's LETTER, the Stuart series: STUART'S CAPE and STUART GOES TO SCHOOL, and the picture books PIERRE IN LOVE, and SPARROW GIRL. Sara lives on Cape Cod, in Massachusetts. Martin Matje illustrated many books for children including HARRY AND LULU, WALLACE HOSKINS, THE BOY WHO GREW DOWN, and CELESTE: A DAY IN THE PARK, THE INK DRINKER, and DO YOU BELIEVE IN GHOSTS.